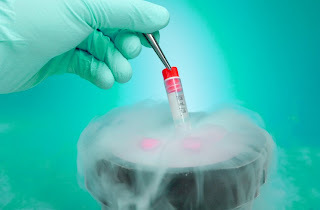 Cryopreservation is a process where cells or whole tissues are preserved by cooling to sub-zero temperatures, approximately below −130°C to −196 °C (the boiling point of liquid nitrogen). By the use of cryoprotectant solutions such as heat Inactivated Bovine Serum Albumin/glycerol/Dimethyl Sulfoxide(DMSO), in these low temperatures any biological activity including the biochemical reactions that would lead to cell death is effectively stopped thereby preserving the original nature of the cells and tissues for long period of time. To prevent rapid cellular dehydration and ice-crystal formation , most systems of cellular cryopreservation use a controlled-rate freezer or Mr.Frosty that uses iso-propanol. First, the cells are taken stepwise from room temperature to approximately −70 °C to −90 °C in a controlled-rate freezer or Mr.Frosty. After 4 to 24 hours, the frozen cell suspension is transferred into a liquid-nitrogen freezer maintained at extremely cold temperatures with nitrogen in either the vapour or in liquid phase (> -140°C ). Frostbite (congelatio ) is the medical condition wherein localized damage is caused to skin and other tissues due to extreme cold. People working in biological and chemical laboratories have chances of exposure to liquid nitrogen and other cryogenic liquid which cause frostbite even with a brief exposure. Frostbite is most likely to happen in body parts which are largely exposed such as finger tips and other extremities. The initial stages of frostbite are sometimes called "frostnip". At or below 0° C (32 °F), blood vessels close to the skin start to constrict. This constriction helps to preserve core body temperature. In extreme cold, or when the body is exposed to cold for long periods, this protective strategy can reduce blood flow in some areas of the body to dangerously low levels. This lack of blood leads to the eventual freezing and death of skin tissue in the affected areas. Frostbite causes skin to appear yellow or white when there is little exposure to cryogenic liquids. There may also be slight burning sensations. This condition of frostbite is relatively mild and can be reversed by the gradual warming of the affected area. Continued exposure to cryogenic liquids is characterized by the disappearance of pain and the reddening and swelling of the skin. When frostbite occurs due to heavy exposure of cryogenic liquids, it results in waxy and hard skin. At this stage the skin dies and edema may occur as a result of the lack of blood. If it is not treated immediately then the damage and the frostbite becomes permanent. Nerve damage will occur due to oxygen deprivation. Frostbitten areas will turn discolored, purplish at first, and soon turn black. After a while nerve damage becomes so great that feeling is lost in the frostbitten areas and blisters occur. Infected open skin can lead to gangrene and might require an amputation. Extreme frostbite without treatment may result in the frostbitten fingertips or tips falling off, as blood is unable to circulate to the affected areas. People susceptible to frostbite, especially those handling liquid nitrogen storage systems should wear personnel protective equipments such as cryoprotective gloves, face-shields and long aprons. Treatment of frostbite centers on rewarming (and possibly thawing) of the affected tissue. The decision to thaw is based on proximity to a stable, warm environment. If rewarmed tissue ends up refreezing, more damage to tissue will be done. Excessive movement of frostbitten tissue can cause ice crystals that have formed in the tissue to do further damage. Splinting and/or wrapping frostbitten extremities are therefore recommended to prevent such movement. For this reason, rubbing, massaging, shaking, or otherwise applying physical force to frostbitten tissues in an attempt to rewarm them can be harmful. Caution should be taken not to rapidly warm up the affected area until further refreezing is prevented. We need to ensure that liquid nitrogen is stored in perfect condition. This has made the industry of 'controlled rate freezers' to grow at a fast pace to keep up with the demand. I am doing a paper on ‘Liquid Nitrogen, their uses and storing methods’ and found your post valuable.